A reporter from a weekly newspaper helped expose a case of election fraud which has resulted in a candidate being banned from public office for five years. 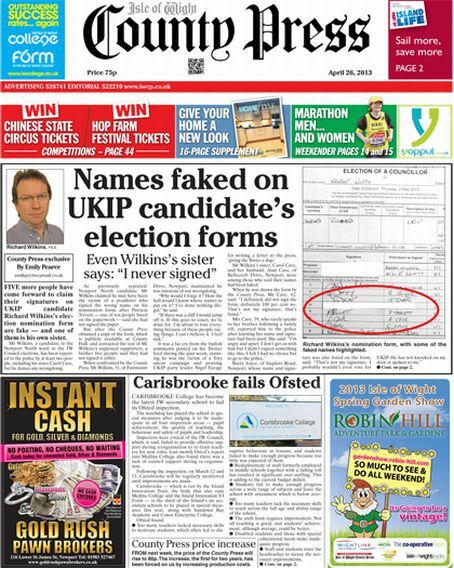 Emily Pearce, chief reporter at the Isle of Wight County Press, uncovered evidence in April that UKIP candidate Richard Wilkins had falsified six signatures on his nomination form. The issue came to light because a Conservative Party volunteer was one of those on his form and Emily then investigated to find that a further five nominees had not signed the form, including the candidate’s own sister and brother-in-law. Wilkins admitted forging the signatures when he appeared at the Isle of Wight Magistrates’ Court earlier this month and was banned from public office for five years and ordered to carry out 150 hours of community work. The paper exposed the faked signatures in April. When Emily looked into the case, the first some of the nominees knew about their names being used was when she knocked on their doors. Wilkins, 51, of Fairmount Drive, Newport, stood in the Isle of Wight Council elections in May for the Newport North seat and came third in the election with 168 votes, despite publicity about investigation beforehand. The court was told that the police investigation was launched after Conservatives discovered one of their member’s names on the form without her knowledge. Tracy Connors, prosecuting, said others only discovered their names had been used without permission when Emily contacted them. Wilkins’ solicitor Barry Arnett said his client had been given the wrong information by UKIP representatives about completing the nomination form. He said: “It was the first time my client had ever stood as a candidate and in my submission UKIP are also to blame in not advising him properly and adequately in election procedures. “He had previously completed a legitimate form but it was rejected because, while they were genuine names and signatures, some of the people were not on the electoral roll. That gave him less than 12 hours to get another form completed. Alan said the paper’s story was one of many that had helped its website audience grow, with it peaking at a record 193,102 unique users in October. Well done Emily. A perfect example of why local newspapers must be cherished if true democracy is to thrive. Yes, hopefully Johnston Press will bear this in mind as they hurtle ever closer to 75 per cent user-generated content with their dismissive attitude to professional journalists. Good for you, Emily, you have made another “old hack” very proud. Another triumph for local journalism. If it didn’t exist or was not allowed the freedom it enjoys, we would be a state-controlled country where our leaders have the ability to get away with murder. I hope the newspapers professional photographer was there to snap him leaving court. Rather than a stock picture of his election photo.